Tottori is a coastal prefecture in the southwestern part of Japan’s main island which can be easily reached from Tokyo by air in just over one hour. The prefecture is famous, amongst other things, for its beautiful sandy beaches and as being the home to the longest Sand Dunes in Japan which stretch for more than 16 kilometres. 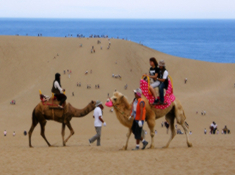 Visitors from all over Japan come to enjoy the camel and horse-drawn rides accross the dunes or just to marvel at the spectacular views. Another major tourist attraction is the majestic Mt. 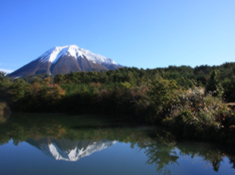 Daisen, the highest mountain in the Chugoku region and popularly known as Japan’s second Mt. Fuji or "Hoki Fuji". For more information about Tottori prefecture, see their official tourism website. 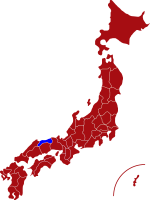 Air - Tottori has two airports, Tottori Sand Dune Conan located in the east and Yonago Kitaro airport located in the western part of the prefecture. Both airports operate daily flights from/to Haneda airport in Tokyo and the flight time is just over one hour. Click here for Yonago Kitaro'sEnglish website. Rail - Journey time from Tokyo is just over 5hours by Shinkansen and Super Hakuto Limited Express via Himeji. From Osaka it takes approximately 3hours by Super Hakuto Express train. Mt. Daisen is the perfect location for a wide variety of outdoor activities or just to enjoy the spectacular natural scenery. 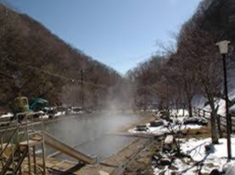 Shikano Hot Spring is a beautiful hot spa resort located at the foot of Mt. Juboyama. A short journey from the hot spring is Shikano Castle Town, which still preserves the character of a bygone era. Tottori Sand Dunes are one of the most scenic sand dunes in Japan and considered a "must-see" for any visitor to the prefecture. 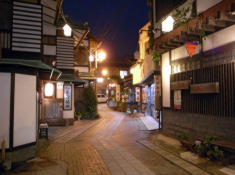 Misasa Onsen dates back to 1164 and is widely considered one of the most scenic places in Japan.